Share your experiences with Thar? One of the most impressive things about the Thar includes how it demands attention wherever it goes. And that comes courtesy of its old school, no-nonsense looks. The front looks menacing, with that in-your-face seven slat metal grille, flanked by round headlamps and the brawny bonnet silhouette. The plastic bumpers, huge wheel arches, excellent ap proach and departure angles for tyres, up to 200mm of ground clearance, the soft-top roof, the rear mounted spare wheel and the exposed door hinges all come together to exude rugged simplicity. In short, no matter what you are in, if a Thar goes by, you will give it a second glance. This is where the Thar feels less than adequate in today’s time and age. The front seats point in the correct direction but the ones at the rear are two benches, facing each other. The dual-tone dashboard tries to liven up the cabin but the fit and finish is far from perfect. As far as safety tech is concerned, there isn’t any; neither ABS, nor airbags. There is no music system either but Mahindra proudly highlights the provision of a 2-din one. Wow! 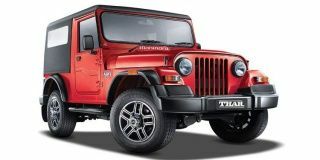 Frankly, expecting a company-fitted music system is a bit optimistic because the Thar doesn’t even have power windows. Force Gurkha : ZigWheels First Drive Pics! Force Gurkha 4X4 Soft Top : In Pictures!